BELSTAFF GANSTER JACKET SIZE T46. NEW !!! BELSTAFF GANSTER. SIZE T 46. Gastos de envío y manipulación . belstaff jacket Original T-L. El estado es Usado. Enviado con Correos: cartas certificadas. Belstaff Roadmaster Jacket - worn Condition. Condition is Used. Photos of rips in photos. Ring missing off top zip. 100% genuine. I have shown the jacket to belstaff and they can recondition it for circa £50-£75. Lining has slight tear as shown. Belstaff H Racer Jacket. This jacket is unworn and as new. Photos without model are actual item. Mark on the inner big Belstaff label - see pic. Arm length from shoulder: 64cm. Belstaff H Racer Jacket Size M (48 IT). Jacket is in good used condition with no cracks on the rubberised coating. 19.5" p2p (see photo 10). 2 side pockets and 1 chest pocket. Made in Romania. 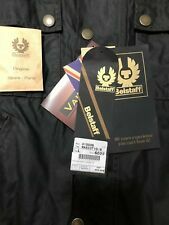 Belstaff Jacket ex display off the Belfast stand few grub marks but otherwise as new size medium 40 42 chest and 20 armpit to cuff,thanks for looking UK bidders and PayPal only. Colour is black. Thick and warm material. Belstaff details on zippers, pockets and arm. British flag on pocket. neck and waist belt. brass poppers. Corduroy material inside the collar and front zipper. Armpit to armpit 19". Approx sizes. Classic four pocket belted design with classic Belstaff lining. All in fantastic condition, the only point of note is a missing popper on the sleeve (pictured). Buy a classic piece of Belstaff clothing for a fraction of the price new. It is a really well made jacket. Belstaff Bomber Biker Jacket 42 UK Size Large. Condition used. Paid £325.00 Bargain £130.00 Immaculate condition Hardly worn. No signs of wear other than the zip is missing a small piece. Do not notice and does not affect the look in anyway. Simple don’t notice it at all. Very dark blue black in colour. Very stylish fit great with jeans. Inside as new no defect. Basically a fantastic very in fashion now belstaff biker jacket. Whom ever wins will not be disappointed. Thanks for looking Post signed and insured. Own a rare jacket, a piece of belstaff history, not many of these will be on the market so grab yourself a real find if you're a Belstaff Collector. Condition is Used. SIZE LARGE. full eagle logo inside lining, zip and button fastening, high neck fastener. 70'S BELSTAFF LEATHER MOTORCYCLE JACKET. DOWN THE BACK, BOTTOM OF COLLAR TO HEM 26". SHOULDER TO SHOULDER 18". SHOULDER TO END CUFF 25". ZIPPED CUFFS. The'Kendal' Leather Biker. The 'Kendal' Leather Biker Jacket. With the edgy biker details. Lend the jacket a signature biker aesthetic. To create the quintessential cafe racer style biker. This sumptuously soft leather inspires a striking contrast. Side pockets, adjustable tabs for fit and a slanted chest pocket are evolved with a more streamlined design in the H Racer. Fitted through the body. Cold machine wash. Do not bleach. Do not tumble dry. This auction is for a Belstaff Racemaster waxed cotton jacket which comes in EU size 46 / UK size 36. The jacket is a brown, almost mahogany colour, and comes in very good condition. There is a very minor, light mark on the arm (pictured) which is barely noticeable. The jacket comes as seen, please let me know if you have any questions. Good luck and happy bidding! Windproof, waterproof and weather proof. Thick and sturdy leather like material. Looks even cooler than leather. Aero zippers. The Jacket has a neck strap fastening with two chest pockets with a press stud closure. At the bottom also another two slightly bigger pockets with press stud closures. Down the middle you have a full zip closure with press stud fastenings over the top. BELSTAFF TRIALMASTER GOODWOOD EDITION WAX JACKET, size 48 / S-M.
Genuine Belstaff HERO jacket size L like NEW!! Genuine Belstaff HERO jacket in size LARGE designed by Joann Johnston and used by Tom Cruise in the movie War of the Worlds 2005. The jacket looks like new. It's Features Include:~ Waxed Cotton, 4 Outer Front Flap Pockets With Snap Closure, 1 Adjustable 'Cafe Racer' Collar strap With Buckle Closure, Underarm Vents, Concealed Main Front Zip & Belt. S H I P P I N G.
Cougar blouson tg.S. in pelle color"a ntique brown", veste una tg.46 italiana. LA GIACCA IN QUANTO. USATA VIENE VENDUTA CON FORMULA "AS IS" VISTA E PIACIUTA. Made in Italy. COLOR: COUNTRY GREEN. FROM THE MALENOTTI ERA. Fantastic waxed field jacket by high end British maker , Knustford. Brilliant quality to rival Belstaff, in fact I think they’re better than Belstaff and I’ve had both. Great design with real leather detailing in cuffs, pockets and shoulders. The coat has a removable gilet padded lining for warmth. Approximately 21” under arm. I take between 40-41 chest as a guide. You will not be disappointed with this coat. Selling at an absolute steal of £95. Fantastic Christmas present. Belstaff Redenhall Puffer Down Hooded Jacket IT46 UK36 Small New Navy Blue. Never worn, brand new from Cruise last week as an exchange. Photo of receipt posted. I’ve bought a Moncler, hence sale. Buy from a trusted seller, any questions please ask. Happy bidding! Great Belstaff hoodie jacket made of wool-cotton blend material. Quite thick and worm. The zip functions flawless. Up for Sale a very rare Belstaff Hero "War of the Worlds" in Bison leather jacket. Excellent condition. This style jacket was manufactured by Belstaff for the movie "War Of The Worlds" which was worn by Tom Cruise. 26.5" Length (Bottom Of Collar To Bottom Seam). S H I P P I N G.